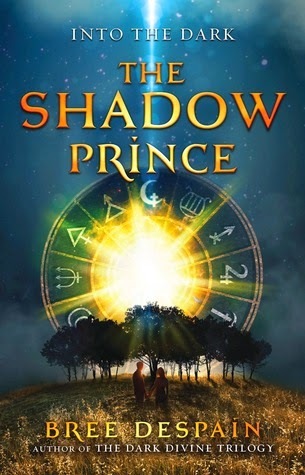 The Shadow Prince by Bree Despain is a new take on some Greek myths, mostly dealing with the Underworld. Prince Haden has been disgraced as a prince and is now sent on an important mission to retrieve a very special boon. Daphne is this special boon that isn’t so fond of the idea of being retrieved. I loved this different take on Greek mythology. At first I was really into the book, then I tapered off a little, but then by the end I was so completely absorbed I wanted to read it again….the same day I finished. I loved the plot and the incorporation of the Greek myths. I thought the concept that Bree Despain comes up with is very unique and creative. I also liked how even though it was a dual point of view. I really felt like it was Haden’s story. Yes of course Daphne’s parts are important but it really felt like he was the character developing the most and it felt so refreshing. I was adored the side characters both good and bad. I had a weird kind of love for Haden. Weird being he kind of comes off as a bit of jerk but at the same time there is innocence about him. He lives in a cut throat world that is really looking to cut his particular throat. He wants to prove himself but is impulsive and gets carried away. He has kind of entitled issue that has been bred into him. The thing that makes him different then the rest of the underlords though is he has conscious that comes out the more you read. So for some reason I formed a fondness for him. He wants to be heartless but he just can’t and as the story progresses I fall more and more in love with him. He is definitely boyfriend book material. Daphne annoyed me in the beginning. I had trouble connecting with her from some reason. I kind of felt like she was a brat. I seemed to like her more when she was by herself rather than interacting other people. She is very judgemental and it bugged when she would say things about Tobin like, I guess i don’t really know him... you’ve known him for a week!!! I kept telling myself it was her situation and she would grow on me. Which she did about halfway through the book. The more she interacted with Haden the more I liked her and the more I understood her. She is one pretty tough girl and I think that her toughness was just coming through to me the wrong way. So by the end I was invested in her character. Lexie, Tobin, Simon, Garrick, Joe, Dax and even Brim. There are a lot of important side characters and I loved how they added to the book. I admit while some I love other I couldn’t stand.Tobin completely annoys me. Especially when he goes off on Haden. I wanted to be like hello Daphne you should be pissed that this crazy guy is possessive over you even though you’ve known him, what one day. Oh wait maybe 3 even though you didn’t talk to him on the weekend. I could probably go on about my dislike of Tobin but I won’t. Simon is properly creepy for a sort of badish guy. There are moments I almost feel bad for Joe. Lexie is pretty awesome, I love when mean girl joins the band of merry men. Garrick, well, I don’t like him. I save the best for last. Dax. I loved the part he had in the story, I want to hang out with him. the awesome bromance between Haden and him kept me invested in the book. When Dax’s story finally comes out I love him even more. I absolutely can not wait for book two and it’s epic awesomeness. The romance is very light in book one because it’s developing. Yes my friends DEVELOPING how crazy is that. I have a feeling that things are going to start moving and shaking in book two on that front. I can’t wait to see where it goes. I also can not wait to see how the story progresses. Big things are revealed towards the end and I wouldn’t say you’re left on a cliffhanger because you’re not I just want to keep reading! So let’s say great plot, great side characters and a great male lead. I will admit I felt a little sluggish at one point in the book but I was quickly resucked in. Even with my early issues in Daphne I would say to definitely pick up the book. If you are Greek mythology lover like I am you most certainly like this take. We hear a lot about this song in the book so I thought I would include it. I actually love the song and thought the same Haden does about it. Yours is the second positive review of this I've read in the last few days. I think it's going on my TBR list. And thanks for putting in the song - I wouldn't have thought to add music to a review, but it seems like this song is really important to the novel.